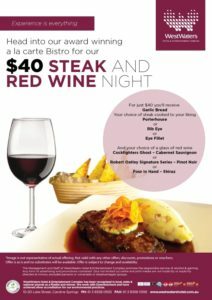 Monday night is $40 Steak and Red Wine night in our award winning a la carte Bistro. *Image is not representative of actual offering. Not valid with any other offers, discounts, promotions or vouchers. Offer is as is and no substitutes will be available and is subject to change and availability.